Six Red Stormers notched goals against Yarmouth Saturday afternoon, including Ainsley Jamieson with three and Bailey Adams with two – the second of which, on a free position, clinched the game, a 9-7 victory. The homefield W bumps Scarborough to 1-0 in 2014, and gives the young team a confidence boost as the season gets going. “This happened last year when we played them,” said Red Storm head coach Marcia Wood. “We were up by six, seven goals, and they just started trickling away, and in the end they got us. Abby Mills opened the scoring just minutes in, on an Adams assist. Jamieson, then Adams, then Jamieson again added points in rapid succession in the following minutes. 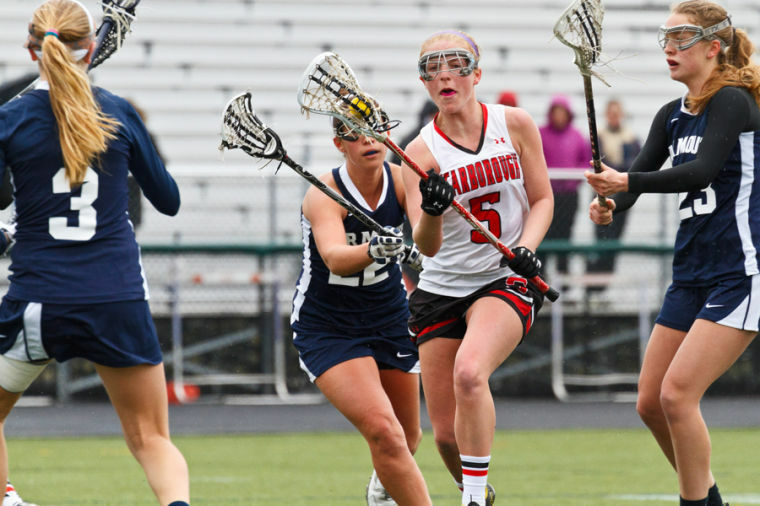 Emma Smith dropped one in as the first half entered its late stretch, and Scarborough had a 5-0 lead. Their eventual triumph wouldn’t come so easily, however. Less than two minutes after Smith scored, Yarmouth’s Lane Simsarian returned the favor for 5-1. The Red Storm’s Sydney Hersey soon answered back, but the Clippers had hoisted their sails to the wind. They hashed two more before the half – one by Molly Maguire and the other by Grace O’Donnell. Upon the teams’ return, Yarmouth in fact took control. Maguire especially proved dangerous, dumping home two more points in the first few minutes for 7-5. Adams saw her team falling back on their haunches a little as well. “It was kind of last-year. I looked at the scoreboard and it was 6-1, and I thought, ‘It’s going to be a repeat of last year.’ But we composed ourselves, we talked to each other, we helped each other out. Near the 20-minute mark, though, and after a series of fouls, Adams found herself with a free position barely a dozen yards out from the Clippers’ net. 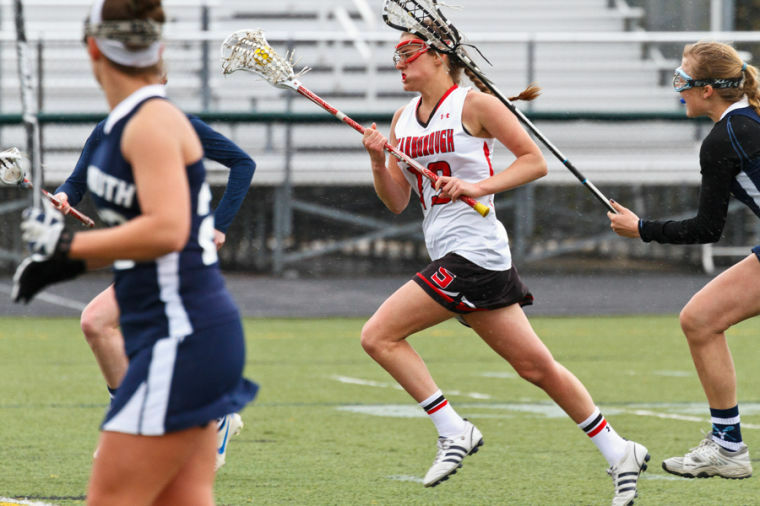 She had a clear path, took a clear shot and scored – Scarborough’s eighth point. “Our sophomores, our underclassmen, are pretty talented,” said Adams. Block stood strong, and her teammates stood strong with her. Yarmouth managed two further points – one by Shannon Fallon at 12:45, another by O’Donnell in the final 30 seconds – but Jamieson tallied another as well. 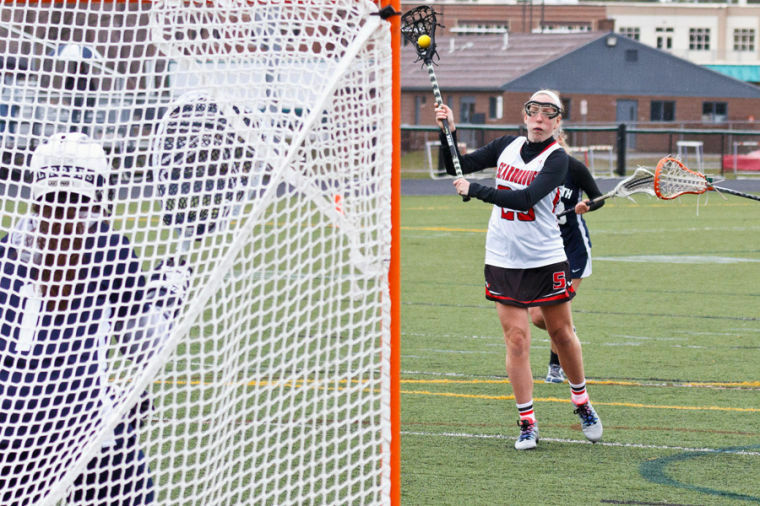 When the dust settled, when time expired on the back-and-forth, Scarborough still stood atop a tough rival. “I thought it was going to take us a little bit to get going, but this was a great showing,” Wood said. 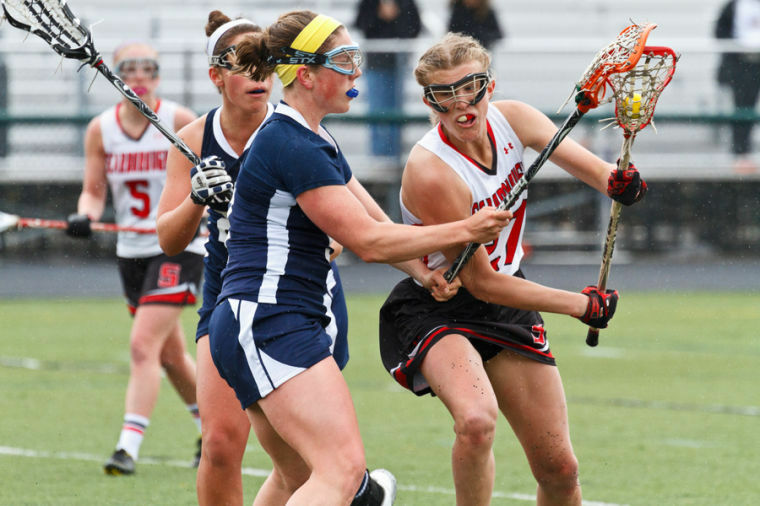 Scarborough next faces off at South Portland, on Friday, May 2, at 5:30. Scarborough’s Emma Smith cuts upfield, beset front and back by Yarmouth defenders. Red Storm junior Kaitlin Prince shoulders around a pair of Clippers defenders. 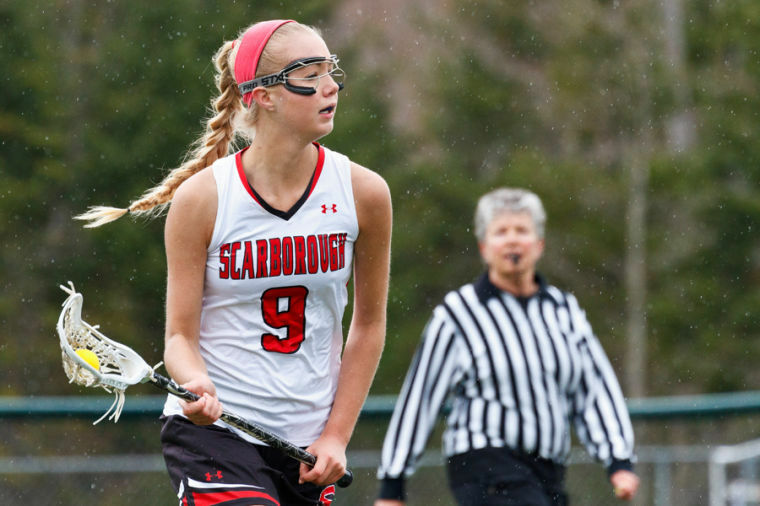 Scarborough’s Ainsley Jamieson looks for a pass through the rain at home against Yarmouth Saturday afternoon. Bailey Adams storms through a squeeze of Yarmouth players on her home field Saturday afternoon. 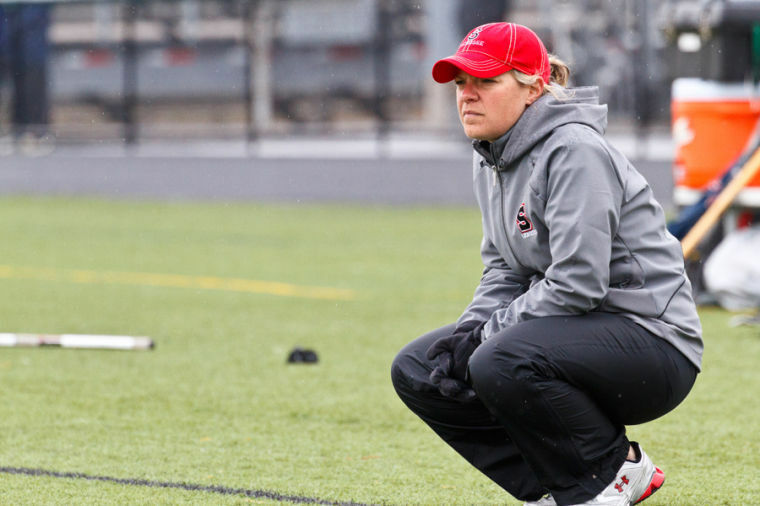 Red Storm head coach Marcia Wood watches intently from the sidelines. Scarborough’s Jamie Sargent rips a shot on the Yarmouth goalie in the Red Storm’s 9-7 victory over the Clippers Saturday afternoon.